Best Memoir I’ve Read This Year!! The plastic bag sat in the parcel tray of my mailbox, the raining pouring down just millimetres away. 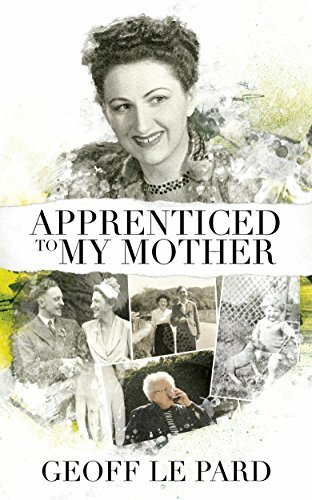 Once inside and dried off the package was opened revealing my copy of Geoff Le Pard’s much anticipated memoir ‘Apprenticed to My Mother’. I flicked the book open, reading title, sub-title, flick again, copyright, published by…. flick, Introduction, I begin reading this. I read on. Chapter one, chapter two, three, four. The chapters are short, pithy, poignant, honest, vulnerable, loving. Tears welled in my eyes but I am completely unable to stop reading, until I am interrupted first by the door bell and then the pets needs to be fed. I tend to the interruptions quickly and return to reading until the gathering gloom of this wintery day’s mid-afternoon makes it too dark to see. I attend to my life, but am keen to finish my day early and,as the rain continues to batter the ground, to take myself off to my cosy bed, book in hand and settle in for a couple or three uninterrupted hours. Over the past year or two Geoff had posted little bits and pieces of this story on his blog and I felt quite familiar with much of what I was reading. But still, the unfolding story ontinued to capture my attention. Here is the mutual love story of two people. She builds him up, she cares for his every need, ensures he feels like the man he aspires to be. He writes her love poems. They clash, they work it out, they raise two boys. She ensures her boys will go out into the world more able to care for themselves than her husband ever could. As Geoff tells us in the introduction, the book is necessarily also about his father. It is about his parents relationship, but also about his relationship with them – separately and together. It’s not detailed, it’s snippets that we pick up as the final years of his mother are told through their interactions. It’s a peek into a way of life, a family that functions and revolves around the mother. A real person, a woman who loves, who cares, who rules with a fist of iron, A woman who, having put herself second all her married life, on becoming a widow firmly and sweetly gets life the way she wants it after all. It’s funny, it’s sad, it’s tender and kind and heart-wrenchingly honest at times. I laughed, smiled, and blinked away tears as I made my way through this memoir. As someone who grew up outside of a functioning family it was a healing balm and quite honestly I loved it, I hope you might too.